Phew, my last post was in MAY people. Serious slacking, right? My spare time has been occupied in Nomzilla, on vacation in Canada, and finding ways to avoid this awful, awful Dutch summer weather. And I also turned 30 (more on that in another post). I was pleased that after 3 weeks away, the non-stop rain and lack of sun didn’t absolutely destroy my plants. 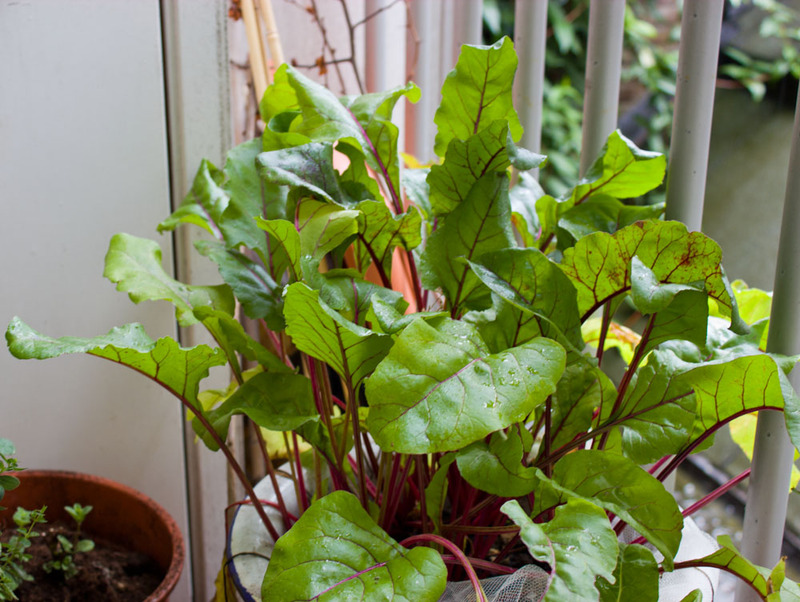 In June, it looked as if the aphids and leaf miners had left my beets and rainbow shard in tatters, but they stuck it out and I’m happy to say I enjoyed some sauteed beet greens last night! I added the calle lillies and the violets to get a bit of colour in there. I’ve also got basil, thyme, rosemary, oregano and mint. I’ve been eating fresh raspberries every morning for the past two weeks! And my super-strong beets have been my proudest achievement. The beets are small, but tasty. 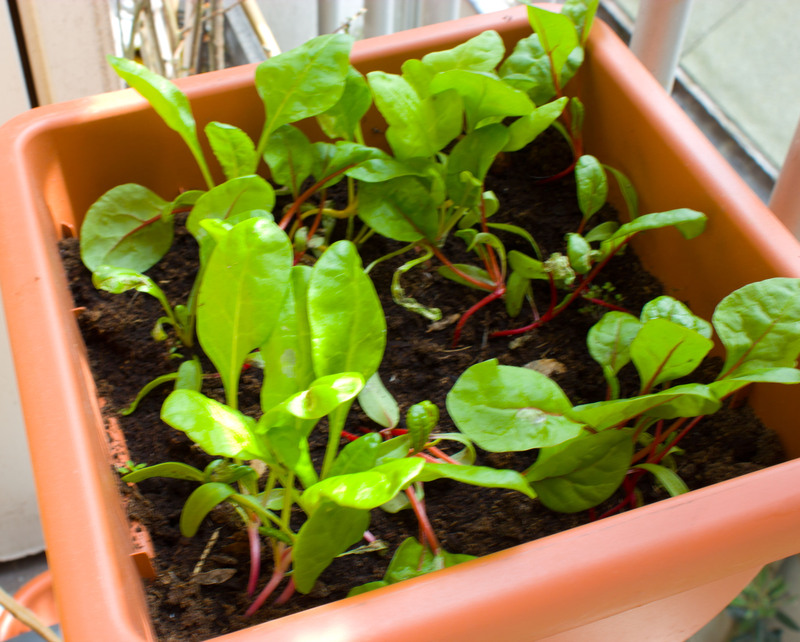 Quite honestly, I grew them for the beet greens because it’s my absolutely FAVOURITE veg ever. Steamed and then tossed in butter and balsamic = dreeeeeaaaamy. This year, I grew my tomatoes upside down. Have you heard of this yet? It’s a great space saver. I got the idea because my Aunt Sharon did it a couple years ago and had success with it. You grow the plants from seed, and when they get their first true leaves (plant is maybe 10-15cm tall), you transplant them into a bucket with holes cut out in the bottom. It’s a two person job. One person has to hold the bucket up (once the plant’s root balls are placed upside down into the holes), and the other fills the bucket with soil. The benefit is that you don’t need to stake the plant, and the water goes straight to the roots. 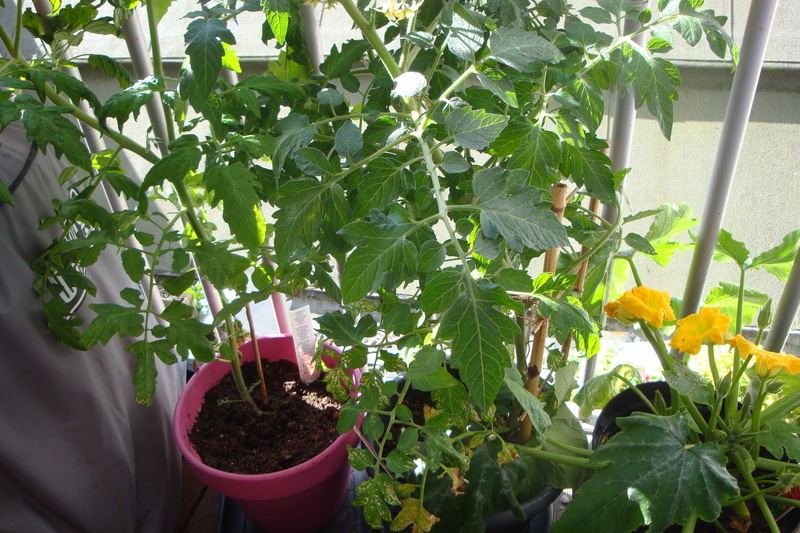 The plants have lots of little green cherry tomatoes waiting to ripen, if only that goddamn sun would shine. SIGH. So, all in all, pretty successful balcony crop this year. 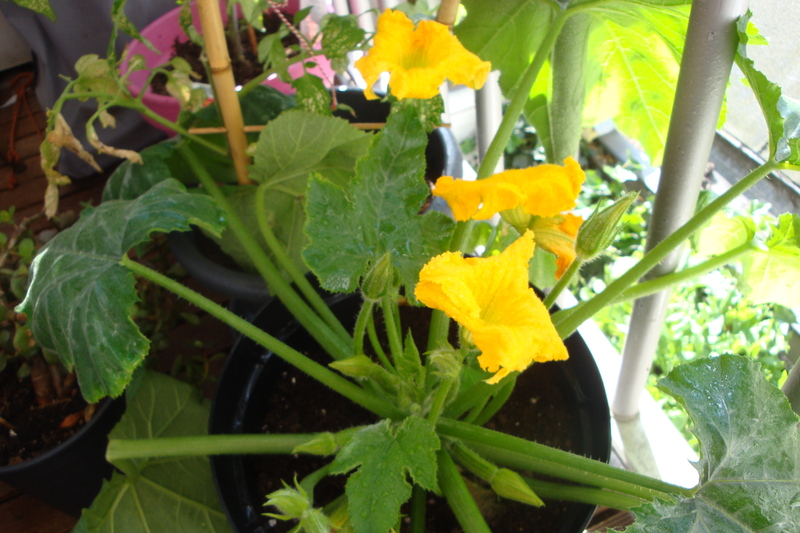 Even on a tiny balcony, I can still enjoy produce that I’ve grown from seed, not too shabby at all! Next year, I’m going to see if I can get a long, deep trough or maybe some larger grow bags. 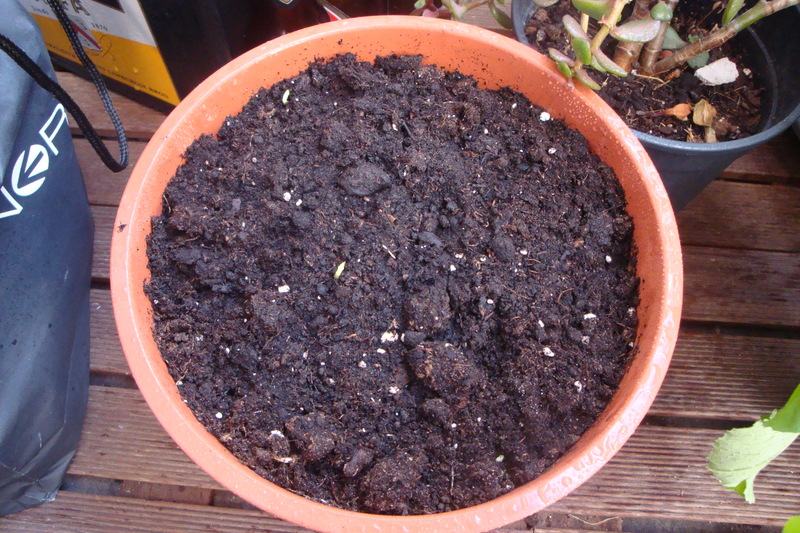 I’m also going to plant some garlic…and hmmm, any other suggestions for small-scale growing? Let me know! When I was a kid, my grandparents lived on a 66 acre farm in Harmony, Nova Scotia. We used to visit them almost every summer, and some of my best memories involve being barefoot in the gardens, picking something for dinner, or for a big batch of jam. Grampa used to feed us raw asparagus straight from the ground, and at 7-years-old, I really thought that was a perfectly normal thing to do. 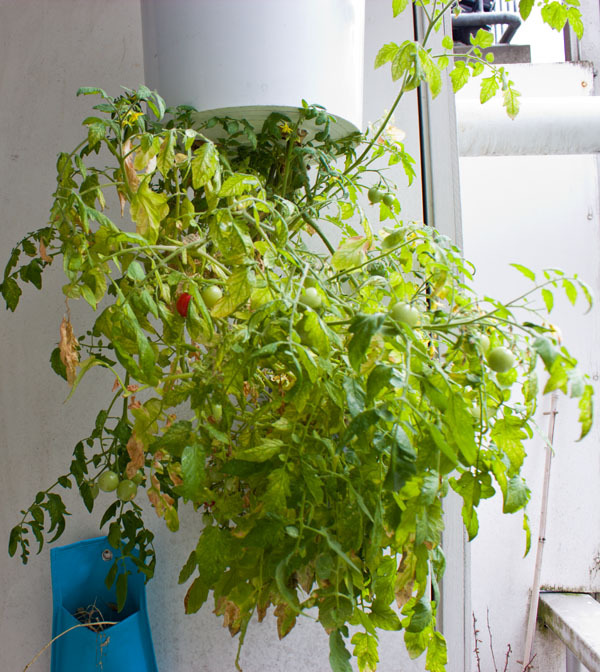 Now that I’ve been in Amsterdam for quite a few years, I realize the effect that having no space for gardens, and therefore, not growing your own food, has on your relationship with produce. For many, fruit and veg comes wrapped in plastic at the horrendous Albert Heijn, a chain that has monopolized the Dutch grocery store market in North Holland. There are a few ‘farmer’s markets’ in the city, most opened only on Saturday, but if you stock up then, you’ve got to eat everything up by Tuesday before it goes off. Just freeze it, you say? Well, most people here have bar fridges with shoe-boxed sized freezers…the kind of fridge you’d have when you were living in university residence. This says a lot, doesn’t it: in most grocery stores here, the amount of space given to fresh produce is often much less than the amount of space given to pre-packaged, ready-made meals. No wonder why the Dutch have a terribly bland reputation when it comes to food, most people don’t know how to cook! Anyways, back to the fresh stuff. My balcony is 1.5 metres deep and probably about 4 metres long. That’s big enough to grow some stuff, so for the past few years, I’ve been doing just that. I’ve successfully grown lettuces and tomatoes, though we went on holiday when everything was ripe last year, so our friend Adam got to eat them all. Courgettes, also planted in April. The peas…I saw a teeny, tiny shoot this morning. I planted these last weekend. 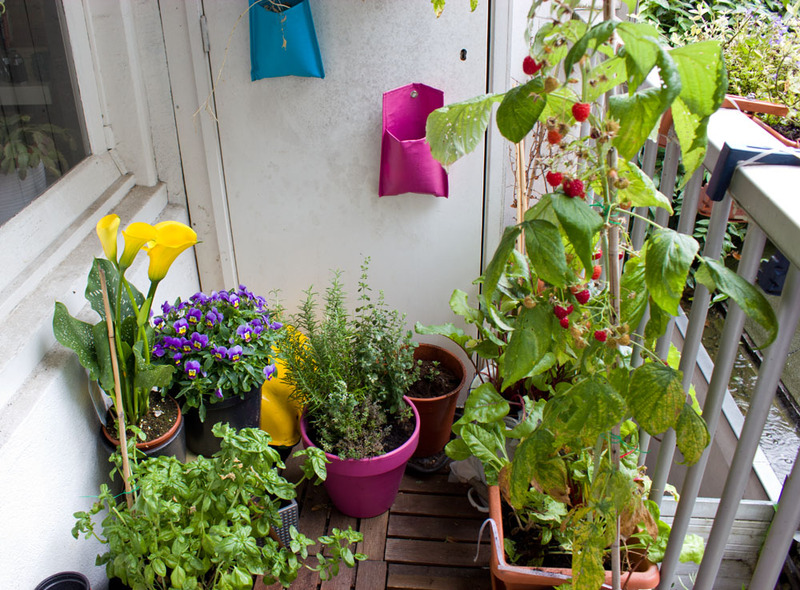 There’s something absolutely thrilling about growing your own food, even if it’s in a small pot on a Dutch balcony. 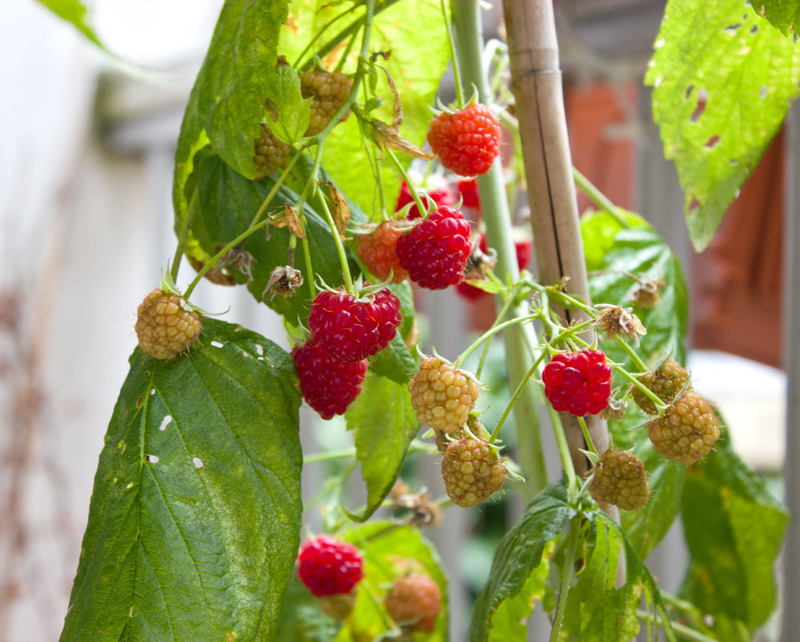 Even if something doesn’t work out quite well (strawberries circa 2009), it’s satisfying standing on my balcony each morning marveling at how quickly something has grown.